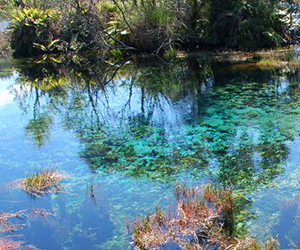 An application for a Water Conservation Order (WCO) for the largest freshwater springs in New Zealand has been accepted and referred to a special tribunal. A WCO is the highest protection possible for a water body, equivalent of National Park status. The Waikoropupū Springs are the largest freshwater springs in New Zealand and contain the clearest water measured anywhere in the world. There are 15 WCOs nationwide covering 13 rivers and two lakes. This is the first application advanced for a springs. A WCO overrides any other planning instrument and requires the identified features or characteristics to be protected in perpetuity. The advantage of a WCO is that any decisions made in future by the Council or the Environment Court on any resource plans or consents would have to be within the bounds of the protective covenant provided by the WCO. Public submissions on the WCO application will be called after the Minister has appointed the special tribunal. The tribunal hears submissions and makes a recommendation to the Minister for the Environment, which can be appealed to the Environment Court. The Minister makes the final decision on the WCO. For more information about Water Conservation Orders please click here.